Widely regarded as one of the finest prop forwards to represent Gloucester, Phil actually commenced his playing career with Cheltenham RFC in 1968. 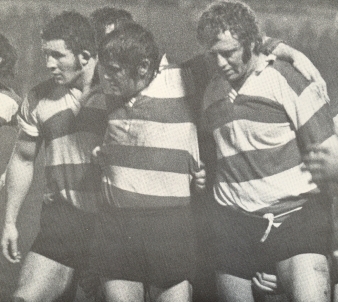 He joined Gloucester in 1971, and his first game was on 13 Nov that year, against Moseley. He soon became a familiar figure in the City of Gloucester where he worked for the family business, a wholesale fruit and vegetable merchants. In a career blighted by injury he played 141 games for Gloucester, and was a member of the National Cup final team of 1982. His last game for Gloucester was against Bath on 23 Mar 1985. Playing in an era when Welsh opposition provided the greatest test, Blakeway recalls one of his finest days was when Gloucester visited Pontypool who had been unbeaten at home for three seasons; he said, ‘we went down and did a job on them. It was a performance full of pride in the shirt – which was what Gloucester were all about’ . He made 19 international appearances for England. As a lad growing up and attending games at Kingsholm, my abiding memory of Phil Blakeway was during a local derby match with Bath where he literally picked up David Trick who was running at full throttle and unceremoniously dumping him into touch….an awe inspiring sight for a young aspiring (if not particularly talented!) prop. Long live King Phil of the Tight Head! !